Most bride's loved their bouquets. Most bride's never saw their beautiful bouquet again once the wedding was over. There are processes to preserve a bouquet, but let's be honest they won't have those same vibrant colors as they did on your big day. One of the best parts of recreating a bridal bouquet in silk flowers is that you get the benefit of an artistic eye hunting down the flowers that made your bridal bouquet unique and lovely. And while not every detail may be an exact duplicate (I'm still working on my cloning machine), it will bring the spirit and style, colors and elegance that it did the day you walked down that aisle. 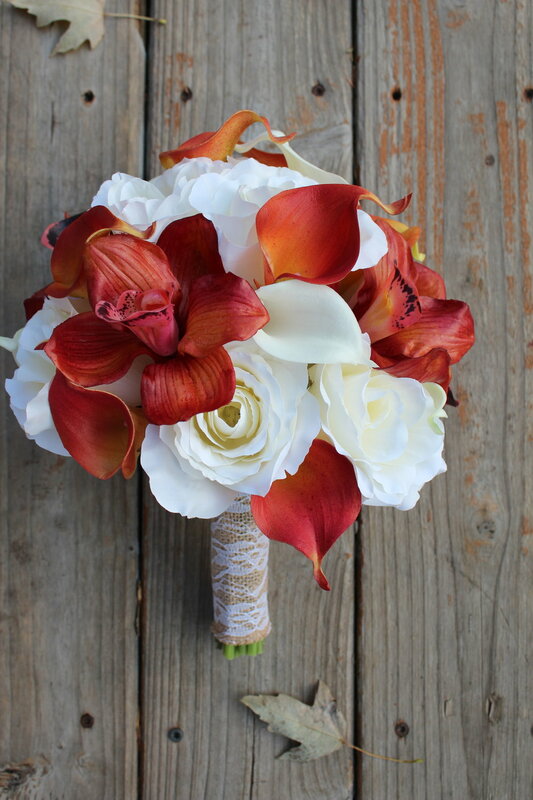 Here's an example of what it looks like to have your bouquet recreated. Photo courtesy of Devlin Photography. I included all the elements from her original bouquet with a new style of wrap that she picked out herself. Now Sabrina has a beautiful reminder of her wedding day. Whether you are interested for your self or someone special, contact me today about a custom bridal bouquet recreation in silk flowers.